Yes y'all...I almost forgot about my Nifty Thrifty Tuesday party. Oh silly me. How could I forget about this fun weekly party, you ask? Well, it's because I have been super busy around here and maybe my age, just might be a tad bit a part of it. Well, as the saying goes, "better late than never", has me written all over it today. Sorry that there are no features this week. So, let's get this party started. 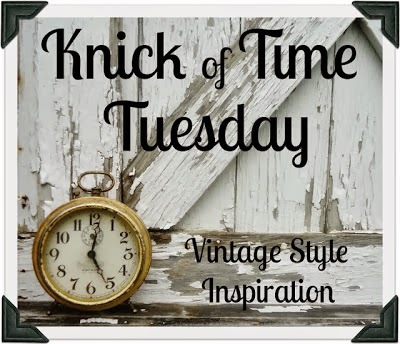 Here I shared some fun vintage goodies. beauties, like this wonderful lace dress. at Shop Talk last Friday. thanks for hosting Linda, have a great week! Hey LInda, thanks for hosting. I love that little dress, but that cabinet with the ironstone from that same post is awesome! We worked our booth spaces today and I need to edit photos and do a post. Meanwhile, I set a MDay brunch with all vintage stuff for this week. Have a great week! Better late than never! Thank you for hosting. Have a wonderful week. Thanks so much for hosting, have a great week. loving the lace dress in your both thanks for the party have a great day. Thank you for hosting and for the great vintage display. Have a lovely week. Linda, thanks so much for hosting! Glad to link up. Have a great week! Yup, better late than never. lol! Thanks for hosting. Good evening, Linda. I hope you had a wonderful day. Thanks for hosting the party! thanks for having us over, have a great week! Thanks for hosting Linda! Your shop always looks so inviting!! Thanks Linda for hosting. Have a great week and a Very Happy and relaxing Mom's Day this coming Sunday. Linda, I love our X & O spoon pendants! Do you sell on Etsy or how can I buy one? Thanks so much for hosting your party for us all. I hope you have a wonderful Mother Day with your family. God Bless.